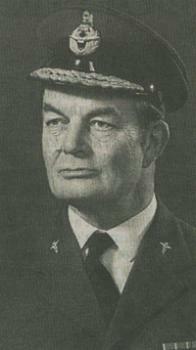 John Nigel Carlyle Cooke was the son of Air Marshal Sir Cyril Bertram Cooke. Some of his earlier years were spent in the north west frontier of India where his father was, at that time, a squadron commander. Being found to have poor eyesight he recognised that he would never be accepted for pilot training so instead went into medicine, studying at St Mary’s Hospital Medical School. Joining the RAF in 1945 he underwent officer training before being posted to the Mass Miniature Radiology Unit at the Central Medical Establishment where, in those days when there was so much tuberculosis, he gained considerable expertise in chest medicine. Over the next few years he served in all the British RAF hospitals, was officer-in-charge of the medical division at RAF Cosford before being posted to the new RAF Hospital Wegberg, Germany in 1954. In 1963 he was in Aden gaining valuable experience in tropical medicine and perfecting the technique of rehydrating babies dehydrated by diarrhoea, by infusing via a needle inserted into their tibial marrow. It was also whilst in Aden that he and his colleagues worked out how to protect the undercarriage of a Land Rover against land mines, so saving many lives. On returning to Wegberg as physician-in-charge he took up glider flying, becoming proficient enough to become both an instructor and competition pilot..
From 1974 to 1979 he was Whittingham Professor of Aviation Medicine then, by now an Air Vice Marshal, Dean of Air Force Medicine, and Chair of the Defence Medical Service Postgraduate Council until he retired in 1985. He is credited with having established the Diploma in Aviation Medicine, still attracting students from around the world. He was a Consultant Physician to the Civil Aviation Authority (CAA), a member of the medical advisory board of the European Space Agency (assisting in the selection of Britain’s first astronaut), and from 1985 to1984 adviser in medicine to the Royal Air Force of Oman. He was appointed OBE in 1956, and CB in 1984, from 1970 to 1985 also serving as Honorary Physician to the Queen. He is survived his wife Elizabeth whom he married in 1958, their two sons and a daughter.